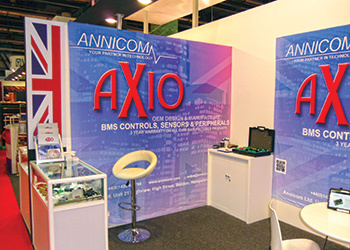 Annicom’s stand at last year’s expo. Annicom’s stand at The Big 5 show will reflect the organic growth that the UK-based company has seen over the past year both in its domestic market and in the UAE. The company, which designs and manufactures a range of building automation and HVAC (heating, ventilation and air-conditioning) controls, sensors and peripherals, will have a larger stand in the British pavilion when it returns to the show this year. At The Big 5, Annicom will put the spotlight on four new products, which will be showcased alongside its comprehensive range of innovative HVAC and BMS (building management system) sensors and peripherals, according to Colin Dickens, export sales manager. These new products include the AX-CN-MAX-P package unit controller; the AX-CN-ST4 and 6 range of on/off controllers in controller enclosures; the AX-HLT, a new range of hydrostatic level transmitters; and AX-TBB, a range of standalone, Modbus and Bacnet thermostats and controllers. The company has this year opened its warehouse in Ras Al Khaimah Free Zone and has shipped in extensive stocks of the most commonly used products. “This will cut down delivery times and shipping costs for our customers,” says Dickens. In the medium term, the company also has plans to move some production to the UAE, he adds. Meanwhile, back in its hometown, the company has acquired the building alongside its factory to double production and stores facilities. “We have invested heavily in the future this year and have also purchased the building alongside our factory in Bordon, England to expand our manufacturing and stores capability. We have moved all our offices to the new building and doubled our manufacturing and stores area,” says Dickens. He says the company has seen a slight improvement in business this year so far. Annicom, one of the UK’s leading design and manufacturing companies, produces a range of compact, reliable, innovative and competitive products for use in the building controls and HVAC industry under its brand name Axio. All Annicom products come with a three-year warranty. With as many as three new products designed and manufactured each month, Annicom prides itself in offering the highest quality products and an exceptional service for all of its customers. In addition, it provides bespoke services to meet special requirements or OEM (original equipment manufacturer) products. In the region, Annicom opened its new warehouse in the Ras Al Khaimah Free Trade Zone Industrial Park in March this year. It employs 25 persons and has an annual turnover of $4.5 million. Commenting on the company’s performance at The Big 5 where it has been a participant for the past two years, Dickens indicates that Annicom managed to secure deals following the event – with 13 new customers added to its portfolio in 2013 and 11 in 2014. This year it hopes to attract further customers while creating awareness of its new warehouse in Ras Al Khaimah. Amongst its major ongoing projects, Annicom is supplying more than 2,400 thyristor power controllers to the new Kuwait University. Other regional projects secured by the company this year include the Vox Cinema at BurJuman, Qstec Polysilicon Factory and Bloom Central Zone, all in the UAE; eight colleges, Al Udaid Airbase and TB Hospital, in Qatar; a Gulf MEP project in Kuwait; and Khoula Hospital in Oman. Annicom can be visited at Stand 2D66 in the British pavilion.